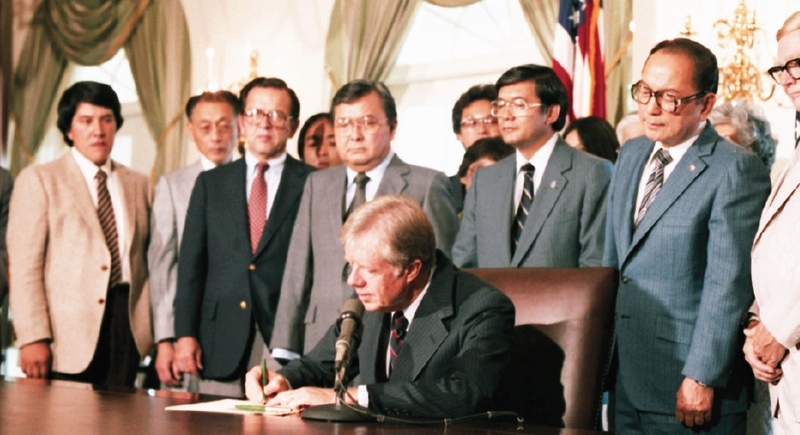 President Jimmy Carter signs the Commission on Wartime Relocation and Internment of Civilians Act into law on July 31, 1980. Standing left are an Alaskan Native representative, JACL President Dr. Clifford Uyeda, Alaska Sen. Ted Stevens, Hawaii Sen. Daniel Inouye, California Rep. Norman Mineta, Hawaii Sen. Spark Matsunaga, and California Rep. George Danielson. TORRANCE — The Greater Los Angeles JACL and the Social Action Committee of Faith United Methodist Church will present “JACL and the Campaign for Redress” on Sunday, March 10, at 1 p.m. at Faith UMC, 2115 W. 182nd St. in Torrance. The panelists will discuss JACL’s national legislative effort from 1978 through 1980s to seek redress for the incarceration of Japanese Americans during WWII. They will also discuss how Sens. Daniel Inouye (D-Hawaii), Spark Matsunaga (D-Hawaii), S.I. Hayakawa (R-Calif.) and Reps. Norman Mineta (D-San Jose) and Robert Matsui (D-Sacramento) laid the foundation for the creation of the Commission on Wartime Relocation and Internment of Civilians, which led to the Civil Liberties Act of 1988.